Emmett just looks so happy to be involved in this cool Apple Watch stand. Now that you’ve dropped a few hundred bucks on your shiny new Apple Watch, you may be tempted to give it someplace to live while you charge it. But you don’t have to shell out even more cash to provide your new gadget with a resting place. Odds are you even have the stuff you need laying around your house right now. 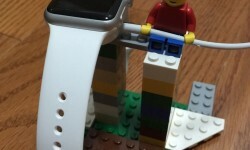 Here are a few cool, creative, and cheap ways Apple Watch owners have found to prop up their preciouses. 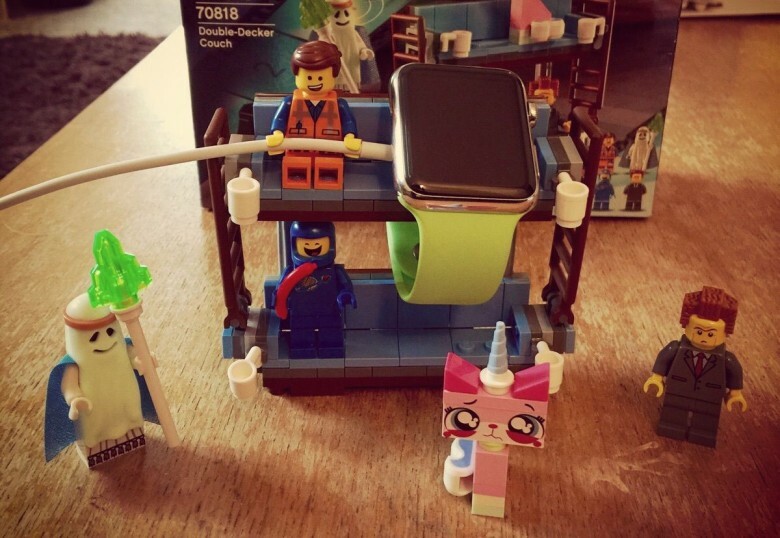 Reddit user aj305 took advantage of the Double Decker Couch set from The Lego Movie (above) and the fact that minifigs’ hands are the perfect size and shape to grip onto the charging cable to repurpose this build into a convenient place to put their Watch. Those Lego hands just snap right onto the cord. If you don’t have this set, fear not: The cool thing about Lego is that you can build anything you want. 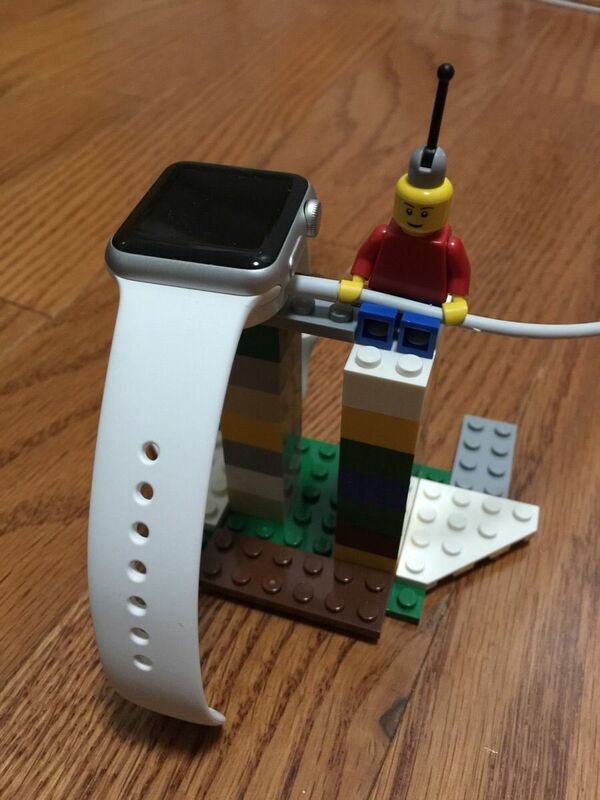 If you have some bricks sitting around, you can craft your own custom stand. User Cooleyandy posted their similar construction on Reddit (right), which works on the same principles but takes up way less space. Do you have an old, weird clock lying around? 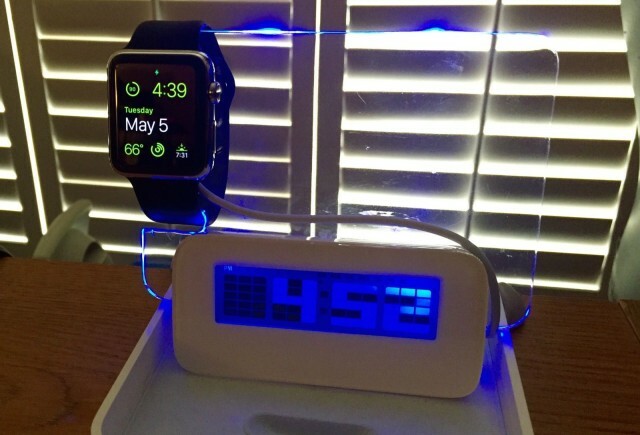 Make it work for you and your Apple Watch. iRichMac shared his own improvised dock, which is an alarm clock he got from Coke’s loyalty program. The attached plexiglass backing was intended for writing notes, but its clever owner used a Dremel rotary tool to carve out a notch for the band and a hole for the charging puck, slapped an Apple logo on there, and called it awesome. And you can still use most of the back, if you want to. If you’re interested in this topic, odds are you didn’t spring for the fancy Apple Watch Edition, which comes in a square box that doubles as a charging stand. If you’re “stuck” with that longer, rectangular box that houses the Sport and you don’t care about keeping it pristine, you can quickly repurpose it to suit your charging needs. 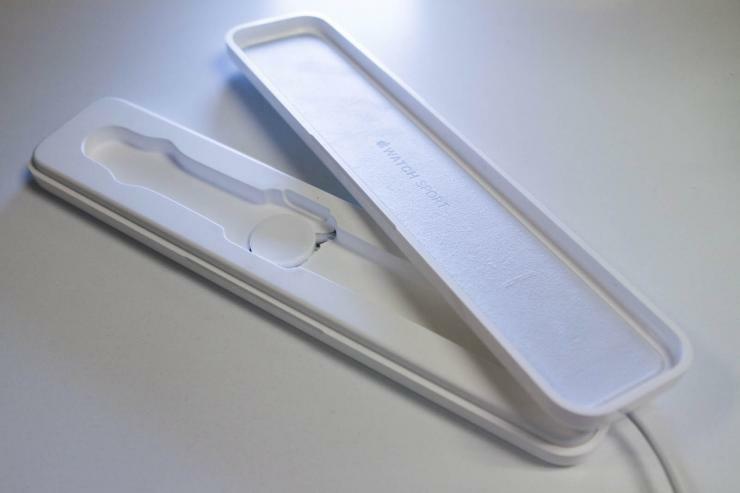 This tip, via International Business Times, involves prying out the plastic insert and then cutting a hole in the bottom for the charger to sit in. If you want to make sure that everything lines up correctly, you can just plop your Watch into the nook on top, and then attach the magnetic puck through the insert and trace it to make sure it ends up in the right place. After that, you just need to cut some notches into one of the box’s short ends to let the cord pass through, and you’re all set. Just maybe don’t put the lid on while you’re charging; all of that heat in an enclosed space might not turn out so well. Time to make that box earn its keep. All this creativity is fantastic, but you may not actually need a stand at all. I just slap the magnet onto my Watch and then lay it down on the stand next to my bed. And sure, that isn’t the most elegant or impressive solution, but you can’t argue with results. Yes, my nightstand is dusty. But it gets the job done. Having said that, I’ll probably end up making one. That nightstand business is boring as hell.